California is home to the tallest trees in the world: coast redwoods. To forest visitors, staring up at the towering canopy of a 300-foot-tall old-growth redwood can feel surreal. “For a lot of people this is an almost religious experience,” said ranger Brett Silver, standing recently in Prairie Creek Redwoods State Park in Humboldt County. Because of heavy logging in the 1800s and early 1900s, only about five percent of the old-growth redwoods remain, with much of that acreage in state and national parks. The forests have also been designated an International Biosphere Reserve and World Heritage Site. But in spite of their status, these sacred groves are facing another threat: poachers. They sneak into the forest, most likely at night, authorities say. They carry chainsaws and wear night-vision goggles. 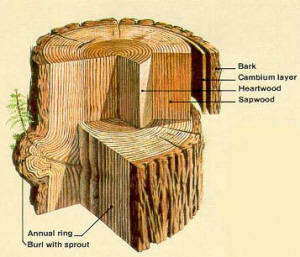 They’re after the trees’ precious burl -- the knobby growths typically found at the base of a tree. Over the years, rangers have discovered a few instances of burl poaching, here and there. But in the past two years, they’ve noticed an increasing number of cuts, some huge gashes up to eight feet across at the base of the trees, some of which are nearly 1000 years old. The problem with cutting the burls off isn’t that it kills the tree. Rather it hurts the chances of a new clone of that tree taking life in the same space. Burls contain dormant bud tissue and can sprout new seedlings. Redwoods are unique in that they regenerate not only through their seed cones, but also their burls, said Jeff Denny, a ranger at Redwood National and State Parks. There are thousands of seeds carried in each grape-sized cone, but seeds rarely penetrate the thick layer of forest debris. 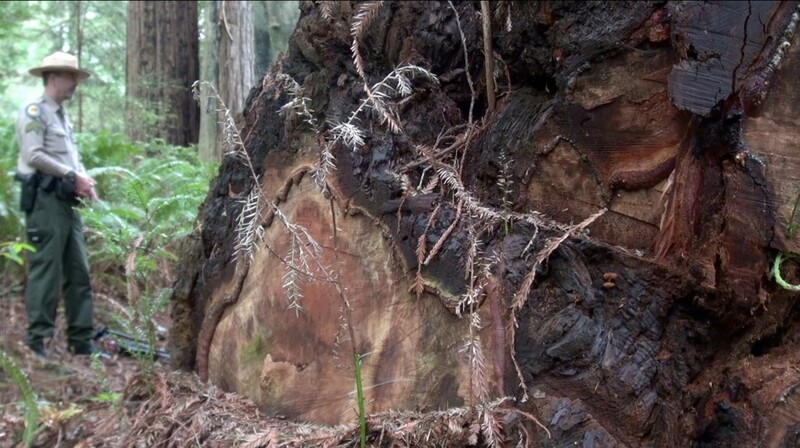 Burls offer the best chance for a redwood to regenerate, he said. Denny brushed his hand over the bright red, exposed heartwood where a burl was cut from an old-growth tree on the south end of the park. These cuts also expose the tree to disease and fire damage, he said. 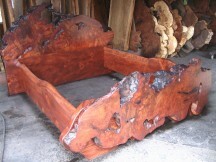 Redwood burl is prized by woodworkers for its swirling grains and deep-red hues. South of Prairie Creek Redwoods State Park is the once-booming logging town of Orick. The town boasts one motel and about eight redwood burl shops. Rangers have investigated the shops over the past couple of years. But until recently, the question of who was committing these crimes was a mystery. Rangers attribute the rise in burl poaching to increased drug addiction and unemployment in the area. “Rural economies, as we’ve all gone through transitions, you leave behind poverty,” said Jaqueline Debets, economic development director for Humboldt County. The timber industry was once the lifeblood of Humboldt County’s economy. Now, due to environmental protections and decreased supply of wood, timber has shrunk to a small fraction of the economy, Debets said. On a breezy April afternoon, Rod Price stood at his outdoor carving shop on the outskirts of Orick. He rushed to a trailer behind his shop, and came out with a raw piece of “bird’s eye redwood” cut into the shape of a feather. Small burl chunks are often shined and shaped into salad bowls or bear figurines. Craftsmen use larger pieces to make one-of-a-kind furniture. Large burl slabs can sell for hundreds, or even thousands of dollars. In May, authorities arrested Danny Garcia, 43, and Larry Morrow, 34, both of Orick. The arrests were the culmination of a year-long investigation. After receiving an anonymous tip, rangers found burl pieces at a local shop that matched the shape and size of a burl cut discovered last year. As part of a plea deal, both men pleaded guilty to felony vandalism charges. Garcia was sentenced earlier this month to 700 hours of community service and required to pay a $11,178 in restitution. Morrow was sentenced to three years of probation and ordered to pay $1,600 in restitution. Three groups, the Center for Biological Diversity, Redwood Parks Association and Save the Redwoods League, are offering a $5,000 reward for information leading to the prosecution of redwood poachers. The parks’ law enforcement tip line is 707-464-7353. Rangers believe there are still several other individuals who are poaching. Ranger Silver says the theft is comparable to robbing a church. “When [people] see the damage that’s going on it really breaks their heart,” he says. KQED NEWSROOM is a weekly news magazine program on television, radio and online. Watch Fridays at 8 p.m. on KQED Public Television 9, listen on Sundays at 6 p.m. on KQED Public Radio 88.5 FM and watch on demand here.